Arsenal cruised into the 4th round of the FA Cup this evening, as the Gunners beat Blackpool 3-0 at Bloomfield to move into the next stage of the competition. Goals from Joe Willock (x2) and Alex Iwobi ended up being the difference between the two sides in the end, as Unai Emery’s side advanced into the next round. 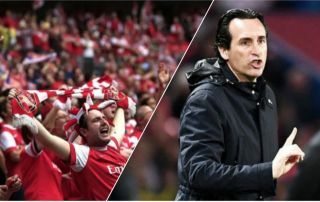 Being drawn against lower-league opposition saw Emery give some of the club’s younger stars a chance, with these players taking this opportunity given to them by the Spaniard to impress. Stars like Willock, Nketiah and Maitland-Niles all played well for the Gunners, who were tested by a tricky Blackpool side time and time again throughout the match. However, it wasn’t these youngsters who caught the eye of Arsenal fans, but Carl Jenkinson, a player we’re sure a few of you out there had forgotten was still at the club! Jenkinson, who was given just his fifth appearance this season by Emery tonight, was very impressive down the Gunners’ right-hand side. This display from the 26-year-old saw a number of Gunners fans flock to Twitter to praise the defender, with some even calling for Emery to start Jenkinson in the near future. We’ve picked out a few of these tweets and included them below. In fairness to these fans, Jenkinson did have an absolute stormer this evening! Start Jenkinson and bench Lichtsteiner forever ?? ?